Join the world's most popular purple dino-star, Barney, in his Super-Dee-Duper attraction — A Day in the Park with Barney. 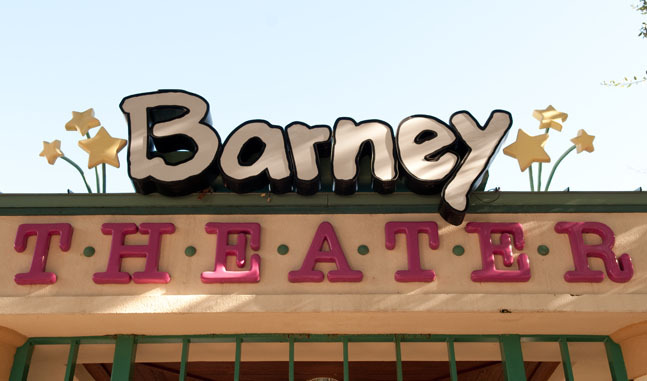 After the show you can visit Barney’s Backyard, a fun and educational interactive play area where kids can explore sand play, walk through an echo tunnel, play with chimes and a musical fountain. 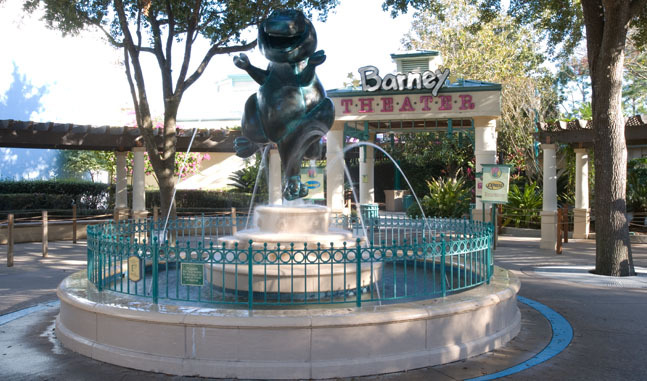 You can also meet Barney and Friends here after each scheduled show! The first showtime of the day is usually around noon, with showtimes every 90 minutes. Arrive at least 15 minutes early and be aware that close immediately at showtimes and no one is permitted to enter after show starts. Perfectly fine for children of all ages, but there is one segment where the theater goes completely dark while they talk about imagination and a few seconds of thunder and lightening at the beginning of a song about raindrops. These moments are brief and don't usually cause any issues with small children. In the weeks around Christmas, this show receives an overlay and becomes "A Barney Holiday" with different songs. See park map for dates and showtimes.